A new agreement between the two countries will introduce closer co-operation to crack down on the PKK’s money laundering and funding activities in Germany. Turkey and Germany are drafting a new agreement that would help cut down on the PKK’s financing activities in Germany, addressing a long-standing concern in Ankara that the separatist group has been able to sustain itself through illegal activities in the country. “We continue working with Germany with the aim of enhancing principles of sharing information in countering the finance of terrorism,” Selçuk Ünal, Turkey’s Foreign Ministry spokesman, told SES Türkiye, without giving more details on the on-going negotiations. Israeli drones have been detected spying on Turkish military units in southern Turkey for the PKK (Kurdistan Worker’s Party), according to Today’s Zaman, Turkey’s English version of the mass-circulation Turkish daily Zaman. The PKK is considered by the US and EU to be a terrorist organization. Turkish intelligence agencies prepared a report after the detection of two Israeli Herons in Hatay and Adana roughly two months ago, claiming that the Herons are collecting intelligence on Turkish military units in order to aid PKK operations in those regions. The report asserts that the PKK’s training camps in northern Syria, near Turkey’s Hatay border “where Turkish military border posts are relatively weak,” were established in those locations based on intelligence collected by the UAVs. The report also claims that Kenan Yıldızbakan, a PKK member who commanded an assault against a Turkish naval base in İskenderun in 2010, has made repeated trips into Israeli territory, reinforcing suspicions of a possible link between Israel and the PKK. If this alliance is to take place, it will have serious and far-reaching consequences for Turkey and the Kurdish question. It is our contention that the Kurds and the PKK, in particular are going to be the most adversely affected by this alliance. How and why did this union between PKK and Israel come up and what can be done to deny Israel this leverage in its conflict with Turkey? Starting in the early 1950s, the Israeli intelligence service (Mossad) developed what was known as “the “periphery policy” of the Middle East in which it planned to establish ties with ethnic and religious minorities in the area in order to break the Arab embargo and the isolation Israel feels. Thus, Israel cemented close ties with some Maronites, Druze, Copts, the shah of Iran and Kurdish leaders and groups…. Consequently, Mossad managed to penetrate the Kurdish movement in the early 1960s. The story of Kurdish-Israeli ties has been detailed in “The Mossad in Iraq” by Shlomo Nakdimon. It suffices to say that the relationship was very exploitive and had harmful consequences for the Kurds. It was Zionist circles which in response to then-Egyptian President Anwar al-Sadat’s request to end the war in Iraqi Kurdistan asked the shah of Iran in 1975 to cut support for the Kurdish revolution. So Kurds have experienced Israel, with tragic consequences in the last century, and the PKK needs to take this into account. The party, known by its acronym PKK, has a long history of violence in pursuit of Kurdish-self rule and is considered a terrorist organization by the United States and European Union. The report also claims that Kenan Yıldızbakan – a PKK member who led an assault against a Turkish naval base in Hatay in 2010 – has visited Israel on numerous occasions, further raising suspicions of his organization’s ties to the Jewish state. Seymour Hersh reported in 2004 that hundreds of Israeli agents, including Mossad agents, were conducting covert operations in the Kurdish regions of Iraq, Iran and Syria. PKK militants have confessed to having received training from Mossad officials. In fact, why the PKK escalated its violence at a time when Turkey became most progressive on the Kurdish issue is a curious question. We even know that “the state,” as Prime Minister Recep Tayyip Erdoğan put it, had been in fruitful negotiation with the PKK’s jailed leader, Abdullah Öcalan, until two months ago. But then, for no apparent reason, the PKK began to attack again, only to provoke Turkey to hit back by bombing the organization’s headquarters in the Kandil Mountains of Iraqi Kurdistan. There are various theories in Turkey on why the PKK is so trigger-happy. Some, including me, think that the organization is simply too fanatic and ambitious, and is more interested in reaping huge benefits for itself, rather than merely make progress on Kurdish rights. Others believe that there are factions within the organization, some of which are manipulated by outside forces – such as “the deep state,” or Syria or Israel, countries which dislike Turkey these days for different reasons. The number of children killed by PKK terrorist organization deliberately is more than 300 since 1984. Actually, we may add ‘stone or molotov cocktail-throwing children’ to the number of victims. The Turkish government has been making efforts to protect the terror victim children via the bills whereas the PKK do not abstain to push them in front of the police with stones and bombs. In recent days a bomb aiming the police exploded in the hands of a kid, who was encouraged for terror attack by the PKK, and he was seriously injured. We know that 90% of the PKK militants at the mountains consist of the children. Thousands of children between the ages of 12-18 are under arms for so-called Kurdish rights. The recent Ertugrul Mavioglu’s interview from Kandil endorses this claim. Mavioglu, journalist, says that “most of the militants are teenagers.” The photos from Kandil Mountain are the very evidence. The kids who are at the ages to be at high school or even primary school posed with weapons. The guy they ironically protect an old man, Murat Karayilan who is 60 years old as the other leader cadre of the PKK. The leader cadre is quite healthy and not injured for years while the thousands of PKK children lost their lives in the armed conflicts. The militant children have a quite short life at the mountains; most of them die before the age of 25. Washington centered CDI similarly wrote that “In 1998, the Kurdish Workers Party (PKK) was believed to have 3,000 child soldiers in its forces, more than 10 percent of which were girls. Reports indicate that the PKK has used children since 1994 and even developed a children’s battalion named Tabura Zaroken Sehit Agit. A child as young as seven was reported in the PKK’s ranks.” (R. Stohl, CDI, 2002). According to P.W. Singer minimum 300 people out of 3,000 is only consisted of girls and age of children falls to 7 in child terrorists (P.W. Singer, Children at War, University of California, s. 19). At the beginning of this year Berlignske Tidende from Denmark wrote that many children are hold in the camps and this is children rights violation. Then UNICEF investigated the subject. A father named Zulkuf K. who lives in Belgium’s Anvers city applied to the Belgium police asserting that his 15 year old son whom he could not get any information for 3 months is abducted by the PKK. Authorities determined that his son is abducted to Northern Iraq, firstly given a ‘physiological training’ (obviously brain washing) then taken to the armed military training. Father is desperate because he knows that Belgium police would not do anything. According to the UN Reports Zulkuf K. is not the only one. There are many families like that. Hence according to some reports not only the Kurdish origin children but also the German families’ children are abducted by PKK. Authorities say that the abducted children are not only used in terror events but they are also used in sabotage, seizure, and courier and in drug events. Belgium Brussels ruler Patrick De Coster said that youths are forcefully brought to the terror camps by PKK after the PKK operations at the beginning of this year. P.W. Singer tells that Kurdish immigrant’s children in Europe are firstly taken to the so-called training camps in Sweden then recruited by the terror organization. 15 March 2006 dated SWD newspaper wrote that the teenagers at the age of 15-18 are abducted from European countries and they are brought to the terror camps in Northern Iraq. According to the newspaper before the training the girls are exposed to torture and sexual abuse. It is possible to give numerous examples. Nevertheless there is no need to this while there are videos aired at the net. 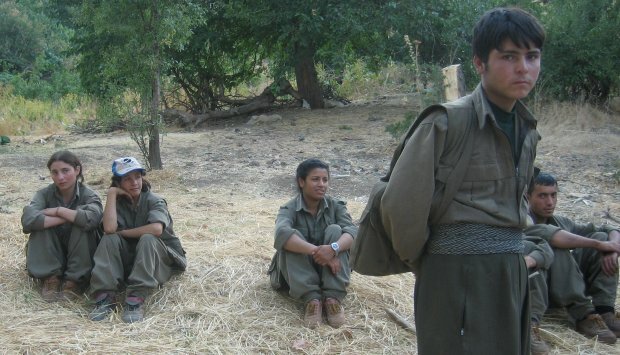 If you take a look for view of the guerillas put in YouTube by PKK, you could see how PKK constituted a children army. The essential number of militants consists of children under the age of 18 at the scenes. It is very hard to find people over 30 among the rest. However the leader cadre is always composed of 50-60 years old people. It is asserted that there are 20 million Kurdish people in Turkey. If the PKK is at the mountains for the sake of Kurdish rights then why only children are at the mountains to fight over this 20 million Kurdish people? Is not this situation weird? How many children will lose their future in order to save the PKK leaders at their 60’s? Can a person even a terrorist be that morally corrupted to hide behind children in order to shoot? It is obvious that PKK is not only pushing Turkey and the region into misery but also the Kurdish children. If PKK really wants wellbeing of Kurdish people, it must say goodbye to the weapons even only for these children victims. The majority of the combat troops of the USA have began to withdraw from Iraq. According to the agreement made between USA-IRAQ, the withdrawal shall be completed until the middle of 2011. However, approximately 50 thousand US non-combatant personnel shall remain in Iraq for purposes such as the training of Iraqi military and security forces. 1-During the seven years that the US presence was in Iraq, various groups in Iraq feel that the Iraqi Kurds have received much more than their fair share and these groups feel an antipathy towards the Kurds. During the US withdrawal from Iraq, it is probable that these groups will turn this occasion into an opportunity to retaliate. Such a development may lead into a civil war. 2-The Iraqi Kurds may start a movement for independence. 3-The Iraqi Kurds may take action in order to enlarge their autonomous geographical area. 4-The Iraqi Kurds may endeavor to occupy controversial areas. In case any of the above mentioned risks is realized, the country will be dragged into civil strife and conflict. For this reason, if the USA does not want to see this happen after its withdrawal from Iraq, it must take preventive action regarding the Iraqi Kurds now. Both the neighboring countries of Iraq as well as the citizens remaining in Iraq are definitely against any movement on the part of the Kurds toward an independent structure. For this reason, such an inception by the Kurds will lead to serious strife within the country as well as threaten regional stability. In this sense, we are faced with the reality that an independent structure in northern Iraq in the short and medium term is unfeasible. If the Kurds go for independent statehood, it is without doubt that this state will not go beyond being an empty frame. In addition, the USA shall endeavor to work on a formula which would ensure a compromise and be acceptable to the Iraqi groups and resolve the attempts at establishing sovereignty over conflict areas and the efforts of the Iraqi Kurds to expand the autonomous regions. The USA intends to ensure that the system it has established in Iraq is not compromised and continues to function. In other words, any attempts at disruption will be prevented. If Turkey is to have positive relations with both Iraq and Northern Iraq, it is vital that the PKK terror organization is eliminated. Particularly, the elimination of the PKK terror organization will also eliminate Turkey’s justification for intervention in Northern Iraq. In conclusion, it is crucial that the intelligence cooperation process regarding the PKK terror organization carried out by the USA-Turkey transforms into a PKK terror organization elimination process. Before its intervention in Iraq, the USA endeavored to gain the support of Turkey. For this purpose, high level US delegations visited Turkey. The visiting US delegations were told by Turkish officials that such a military enterprise would amount to “opening Pandora’s box and the gates of hell”. Turkish officials even endeavored to discourage the US government from such an enterprise. There are approximately 2.700 different clans and 16 various sects with mutual ties living in a geographical area spreading from Africa to the Middle East and on to Central Asia. Interfering with any part of this structure will result in disrupting the established system on this large geographical area and it will be impossible to prevent the ensuing chaos. However, the Bush administration did not take the Turkish discourse seriously. At that time, the USA was determined to redraw the maps of the Middle Eastern countries within the scope of the Great Middle East Project and had selected Iraq as its starting point. The intervention on Iraq opened Pandora’s box. As a result, Iraq was almost divided into three parts during 2005 and 2006. However, the US which wanted to divide Iraq was politically shattered. The division of Iraq was prevented by neighboring countries which did not sanction the division. Now that the US is withdrawing from Iraq, in order to protect its interests, it wants to have stable Iraq with good relations with its neighboring countries. In addition, the US wants all the countries in the region to develop friendly relations. The country to lead these efforts is Turkey. Because of its status, Turkey is in a position to design the region and the US prefers that the region is administered rather than lead by a country which is well familiar with the region. A short while after the Hariri assassination which took place on the 14th of February 2005 in Lebanon, Turkey prevented an intervention of the US on Syria which was about to take place. Since Turkey has always taken part to bring about peace and its status as a structural regional power, the US has put Turkey in the forefront as the leading force in the Middle East for the new era. Including its relations with the regional countries as well as the importance given to stability, peace and security, Turkey applies a zero problem policy with its neighbors. However, it is clear that the valid policy in the Middle East is power. If mutual goodwill is not the rule and power is inadequate, the zero problem policy will not be sufficient. The Turkish government is currently assessing a plan to create a special ground force exclusively dedicated to fighting Kurdistan Workers’ Party (PKK) militants along the country’s southeastern border with Iraq, NTV reported July 14. Members of this special unit will receive advanced training, high compensation and will operate in conflict zones in southeastern Turkey (and northern Iraq if needed) for long periods, unlike conscripted soldiers. The plan, which was reportedly proposed by Turkish Prime Minister Recep Tayyip Erdogan during a meeting with the leader of a minor opposition party, comes shortly after outgoing U.S. Ambassador to Turkey James Jeffrey said the United States has cleared the airspace over northern Iraq for Turkey’s use, and said military cooperation with Turkey is more “flexible” now. Besides taking its own military measures, Turkey has been demanding cooperation from the United States against the PKK — which has increased its attacks against Turkish troops since June 1 — beyond sharing intelligence. Military cooperation between the two countries against the PKK, however, is likely to have implications on other parts of their relationship, as NATO Senior Civilian Representative in Afghanistan Mark Sedwill during his visit to Turkey on July 12 asked the Turkish government to extend its mission leading the Kabul Regional Command for an additional year. The United States repeated the significance of Turkey’s presence in Afghanistan, as a Muslim country that has good relations with Kabul and Islamabad, as well as various local Afghan factions, on previous occasions even though Turkey does not have combat troops there. Turkey is yet to announce its decision, but Ankara is likely to respond positively, given the interdependence between Turkey and the United States on military matters. Turkey has asked Iraq, the United States and the Regional Kurdish Administration in northern Iraq to hand over nearly 250 outlawed Kurdistan Workers’ Party, or PKK, members, the Hürriyet daily reported Saturday. The list of 248 includes PKK chiefs such as Murat Karayılan, Cemil Bayık and Duran Kalkan, and Ankara wants the handover to be “as soon as possible,” the newspaper said, quoting unnamed senior Turkish officials. Turkey has also mooted a joint military operation “if necessary,” Hüriyet said. “The net is tightening,” an official said, speaking on condition of anonymity. According to experts, there are some 2,000 PKK members holed up in northern Iraq from where they stage attacks on Turkish territory. The PKK has significantly escalated attacks against Turkish targets after jailed leader Abdullah Öcalan said in May that he was abandoning efforts for peace with Turkey and the terrorist group called off a unilateral cease-fire last month. Three soldiers and 12 PKK members were killed in clashes Tuesday. Turkish General İlker Başbuğ, the chief of general staff, last week strongly criticised the Regional Kurdish Administration in northern Iraq for failing to take action against PKK. The PKK is listed as a terrorist group by Turkey, the United States and the European Union. Should Turkey Declare War on Iraq? The United States invaded Afghanistan, as it kept a group of terrorists. After refusal of the Taliban with regard to the extradition of Osama Bin Laden, the U.S. decided to invade Afghanistan. According to Americans, Afghanistan was now a source of terrorism and terrorist attacks like 9/11 were carried out by those who came based in Afghanistan. As a consequence of preemptive approach, the U.S. intervened to Afghanistan and pushed other allies to come to the country behind herself. It can be definitely said that the U.S. was not successful in the past nine years: Currently, Afghanistan turned into a bigger source of terror and has made her neighborhood resemble herself. Despite her definite and clear failure, the U.S. has maintained her military-based policies in Afghanistan and expects international society to support herself with no hesitation. By following the same logic, Turkey has to invade Iraq immediately: There are 5,000-6,000 PKK terrorists in northern Iraq, and they regularly cross the Turkish border in order to attack Turkey and return to Iraq. Places where all terrorists stay are evident. Unlike Bin Laden, they do not live in unknown caves. The coordinates of their camps are known by several states’ security agencies. Moreover, different from Al Qaeda, they live in the Kandil Mountains, which can be besieged easily. If logistic support to the Kandil Mountain is prevented and crossing paths are controlled, it is clear that the PKK will be in trouble. Furthermore, hundreds of PKK terrorists leaving the camps move around in Iraqi territory. In other words, terrorists pass across areas already patrolled by U.S. soldiers and Barzani’s Peshmergas, also under the control of U.S. air forces and satellites towards Turkey. Just after carrying out terrorist attacks, they return to the Kandil in front of the same eyes. The PKK killed more than 5,700 civilians so far. The number of children killed by the PKK is over 370. In other words, if the PKK is not a terrorist organization, then who could be a terrorist? The PKK is enlisted as a terrorist organization by the U.S., Britain, Germany, France and many other states. Like the former U.S. President George W. Bush, the new President Barack Obama declared the PKK as a ‘common enemy’. American presidents said there is no difference between Al Qaeda and the PKK. Despite the situation and rhetoric, the PKK has managed to survive in Iraq, which everyone has known for years. In addition, from the 2003 Iraq War up until today, the PKK has multiplied its number almost three times under the wings of the U.S. forces. Under these conditions, it is necessary to ask, should Turkey, just like the U.S., invade Iraq to stop terrorists’ maneuvers? In the same way, should Turkey, likewise the U.S., seek help for counter-terrorism assistance as it is cited in Article 5 of the NATO alliance’s agreement in case of being attacked by terrorists from outside? Our American friends, in the face of these criticisms, present the difficulties of geography in Iraq, armed PKK militants etc. as an excuse. But in vain, it is strange that the U.S., a country that has taken the risk for many years to fight in Afghanistan, hesitates to involve in fighting against the PKK in a relatively easy geography. Moreover, at this point it is necessary to ask how many PKK terrorists have been neutralized in Iraq by the United States since 2003. Let us ask our questions in a simpler way, since 2003, has a single PKK terrorist been harmed by the U.S. forces? Zero. The number of PKK terrorists who were captured, killed or harmed by U.S. forces is zero. In the last 7 years none of the 6,000 PKK militants was captured by the American friends. Turkish people think the U.S. supports the PKK against Turkey. All surveys, studies and observations clearly prove that there is strong mistrust among the Turkish people against the U.S. PKK policies. Unfortunately, the statements we have described above reinforce these perceptions. Even some American journalists wrote that the U.S. provides financial assistance, ammunitions and training for the branches of the PKK. The U.S. declares Syria and Iran on the lists of countries that support terrorism. Should Turkey prepare a similar list and includes the U.S.? Has the U.S., which has declared anyone as a terrorist, ever reviewed its own reports for Turkey in a sincere manner? Clearly, it would be impossible to improve the relations between Turkey and the U.S. as long as the U.S.â€™s stance against the PKK remains the same. Under these conditions, the U.S. and Turkey can operate neither in the case of Iran nor in the fight against terrorism. In this context, the U.S. Defense Secretary Robert Gates, who claims Turkey walked away from the West due to errors of the European Union, has to consider the American mistakes as well. Obama says the PKK is a common enemy for Turkey and the U.S. while only Turkey, Syria and Iran fight against the PKK. * Assoc. Prof. Sedat Laciner is the general coordinator of the International Strategic Research Organization, or USAK. Danish newspaper Berlingske Tidende continues to publish more information about ROJ TV and the PKK. Their most recent report reveals that the PKK is using children-fighters. Pictures taken by former ROJ-TV director, Manouchehr Zonoozi, show youth, the youngest of which is supposedly 14-16, and Zonoozi claims, he saw children in the camps as young as 8-9. Putting aside the issue of using children as soldiers, Zonoozi makes another very interesting claim. He says that most children in the camps come from Iran or Europe, and don’t have their parents with them. The youngest get school education, the older ones are trained in using weapons, fighting and Kurdish history, with emphasis on the PKK and the movement’s founder, Abdullah Öcalan. “In an asylum camp in Iraq, I met a Syrian-origin Kurdish family. They were looking for their daughter, who fled to the PKK. But the PKK didn’t want to give her back to the family. I was really upset at that,” says Manouchehr Zonoozi.